Ramblings from a rarity in the airline industry. It’s the start of a four day trip that’s already been cut short by two days because of my last three day trip that had me working eight days in a row (which is illegal – I can only work a maximum of six days). This is no normal trip for me. As a check flight attendant I’m responsible for training newly graduated flight attendants, and today is not only this new hire’s first day but also my first day training. Neither of us has any idea what to expect. All I know is that she was the “valedictorian” of her class, and because my trip has been cut short I only have four legs with this girl before she moves on to another check flight attendant to finish out her training on the CRJ-200. I looked at the passenger loads last night to see how difficult her first day may or may not be, and thankfully they were pretty light. This first leg to LGA she is just shadowing me, watching me during boarding and during the service. I’m asking her questions to test her job knowledge and explaining everything I’m doing (or trying to anyway). We only have 25 people on board and it’s early so most people are asleep and the service is over before we know it as is the flight. With only 26 minutes on the ground in New York boarding for the second leg is almost immediate. For this flight we only have 17 passengers so the main cabin door closes pretty quickly and we get ready to do the safety demo. It’s the new hire’s turn to do the safety dance, and she does it very well if a bit theatrically. We secure the cabin and notify the flight deck that we’re ready to go. Because of an incredibly long line behind us it takes us 45 minutes to even push back from the gate. We’re finally in the air, and she makes her announcements with great style and aplomb. We start the beverage service, I’m following behind her, watching her take orders and serve drinks. We’re in the middle of the cabin when the flight deck calls back. I go to the front to answer, and the first officer tells me we’re diverting to Philadelphia, to put the cart away, and prepare for landing. He doesn’t tell me what’s wrong, and in effort to get everything put away as quickly as possible I don’t ask. I just know that he’s not asked me to prepare the passengers for an emergency. We get everything put away, and I make an announcement telling the passengers that we’re diverting and going to be landing soon. I tell them there’s nothing to worry about and that this will be a normal landing. Everyone seems to be doing OK so I sit down in my jumpseat. A few minutes go by and I can hear that the guys up front are wearing their oxygen masks. I know we haven’t lost pressurization because the masks in the back have not dropped, but I’m still wondering what’s happening. Finally, the first officer calls back and tell me the windshield has cracked and they have the masks on just in case they need them. I make another announcement telling the passengers why we’re diverting, and this time I walk through the cabin to check on people and make sure everyone is still in good shape. One passenger stops me and asks if it is raining in Dayton (where we’re going). I tell him it is not, and he asks if it is raining in Philadelphia (where we’re diverting). I tell him it is, and he asks why don’t we continue on to Dayton where’s it’s not raining instead of going to Philadelphia where it is raining. I wonder if this guy thinks airlines usually tell people they’re going to be flown to one location only to change their mind and instead take them somewhere else. I remind him that the windshield is cracked and the captain is not going to fly all the way to Dayton with a cracked windshield. His response is one that would indicate that he didn’t listen to the announcement I just made saying as much. I don’t know about anyone else, but if I were a passenger and the flight attendant made an announcement saying we were diverting to another airport shortly after taking off and without reason I would then listen to everything that was said from that point on. Apparently, though, this guy couldn’t be concerned with details. Twenty minutes go by and we finally land and pull up to the gate. 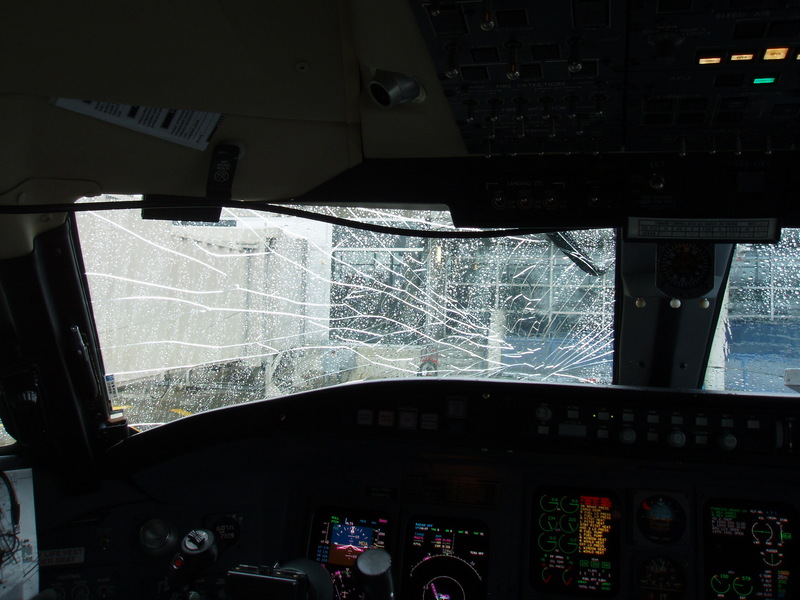 The flight deck door is opened and boy is that windshield cracked. One of the supervisors tells me that the flight is most likely going to cancel and to ask the passengers to remain in the gate area after deplaning. Everyone gets off the plane, and it’s just the four of us on there for the next hour and a half. After the initial glance at the windshield by the police and a maintenance guy, no one else comes out to look at the plane. 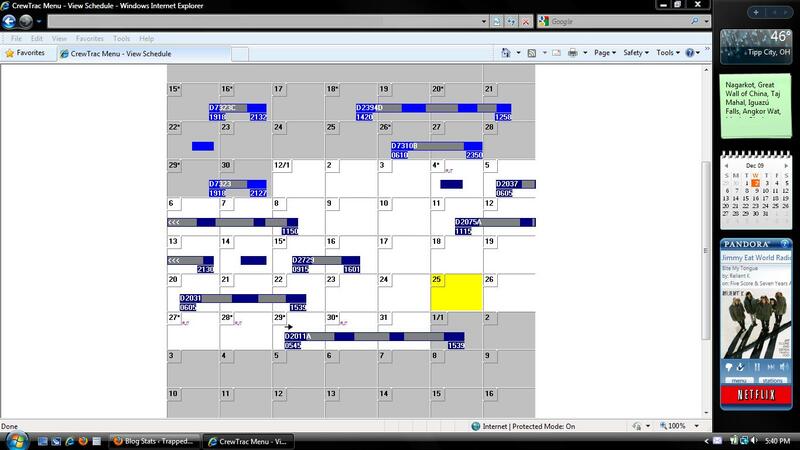 Scheduling finally calls us and sends us all to different places. My new hire deadheads down to Washington, DC to meet up with another crew and the pilots go to Charlotte to spend rest of the afternoon in a hotel. I, however, get to hop on a plane back to Dayton where my day finally ends around 7pm. A four day trip has turned into a one day trip. I don’t mind this at all because I still get paid for all four days. One of the benefits of being a fancy lineholder is cancellation pay. Since all those flights were part of my original schedule I get paid for the them even though I don’t work them. I just scored three paid days off. When it comes to my monthly schedule, I’m living on the bubble. My seniority in base is just high enough where I can hold the reserve schedule I want if I bid reserve (meaning I get the days off I want, but not necessarily the work) or if I’m lucky I get whatever is left over of the trips after all the bids have been awarded. Yes, I must bid on my schedule every month, and most times I have no idea what days I will be on call/working or off to trot about the globe. It’s never the same, which plays a big part in why I like this job so much. I call this uncertainty the bubble, and frankly, I don’t know why anyone might call it anything different, but I’m sure someone does. For the month of December my company was offering Enhanced Leaves of Absence, meaning we could not work and not get paid, but keep the job and keep the flight bennies. There were also several weeks of planned absences what with vacations and recurrent training coming. Needless to say I was pretty sure I would be awarded a line for the month, even if it was just a build up line (a build up line is a schedule made up from leftover trips that weren’t or couldn’t be awarded due to vacation or leaves, enhanced and otherwise). But when I was in the bidding process I had a hard time deciding what to bid for. I wanted the 11th-14th to go to Arkansas with my family to see my Granmama (yeah, that’s what I call her, emphasis on the Gran), but I also had to bid to work on the 15th and 16th so I wouldn’t lose any days off with my recurrent training. Adding to that, I also wanted to try and get Christmas knowing I wouldn’t possibly get it for the second year in a row. Click to peep it, G.
Yeah, that’s right. I have the 23rd-28th off. I’ve not even been here two years, and I’m a fancy line holder and holding Christmas. Also, if you’ll count them up, I have 14 days off. Fourteen days is roughly (and by roughly I mean exactly) equivalent to two full weeks. It also gets a bit better here: the 15th and 16th is recurrent training so I get paid to sit in a classroom and be “taught” things I already know and not deal with ornery passengers. I’m only actually working 15 days out of the month. December will be pretty sweet except for the fact that all those trips are on the dreaded CRJ-200; I couldn’t trade away any of them. Thankfully, I work with the same pilots on two of those trips, and those guys are cooler than the other side of the pillow. Hopefully, life on the line will continue next month, but I have to expect to be back on reserve so I don’t get my hopes up. You just never know when you live on the edge in the shadows on the fence on the bubble (I tried other phrases; they just don’t work).